Want to set yourself apart from the competition? Build awareness about the subjects you care about by creating eye-catching pamphlets that your audience will want to pick up and keep. Whether you’re creating a pamphlet to promote awareness about your community’s latest conservation project or to educate an audience, its design can be the difference between being noticed or collecting dust on a shelf. Canva can help you get your pamphlet design right and take it to the next level. In fact, they’ll look so good that you’ll never have to hire an expensive designer or have to worry about your pamphlets ending up in a bin again. With Canva, you can customize and personalize your pamphlet as little or as much as you like with fonts, images and elements that suit the purpose. In minutes you can have an eye-catching pamphlet that makes your cause and subject something to remember. Create a new Canva account to get started with your own pamphlet design. Your own professional images will look fantastic in a pamphlet designed with Canva, and if they’re not entirely up to scratch, no worries. You can still make a great impression by enhancing your imagery with our powerful and easy-to-use photo editing tools that can help you crop, filter and correct your images until they’re absolutely impeccable. If you don’t have your own images, that’s no problem. Canva gives you access to an enormous library of over 1 million stock images, illustrations and design elements for your use. If any premium images or elements catch your eye, they’ll only ever set you back $1 a pop, which means that no matter what your budget is, a perfectly designed pamphlet is always within reach. Is designing your pamphlet a group effort? Or do you need to get feedback on your design? If you’re working in a team, you might want your colleagues or friends to see what you’ve achieved. With Canva, even working with a team based in multiple time zones isn’t a problem. 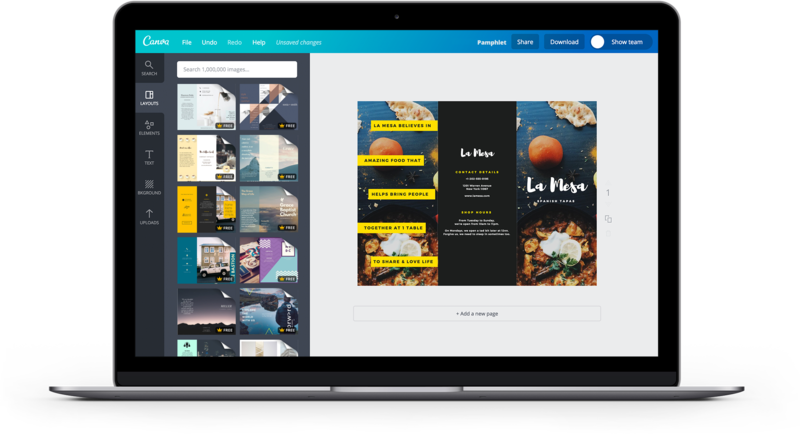 Canva’s simple-to-use platform makes it easy for you to collaborate and share your designs. All you really need to do is click the ‘Share’ button to email your design directly to a contact or send a link to whoever needs it. Want to share it on social media? Again, all it takes is a simple click of the ‘Share’ button to get your design out into the world. Once you’re done designing your pamphlet, it’s time to print and distribute it to the right audiences, mailboxes, community centres and more. All you need to do is click “Download” and choose “High quality PDF” to get a high-resolution file that’s ready for printing. The quality is so good that you can print your pamphlets at home, but if you want to send your file to a professional printer, it’s simple to do that too! Create a pamphlet that is instantly recognizable by uploading your logo, using your brand color palette and consistent fonts. To upload your logo, click on the Uploads tab in your object panel, select the Uploads folder, and click on the green Upload your own images button. Select any PNG, JPEG or SVG file you wish to upload from your computer.